We at Pamela Soap have always loved the deep and simple elements of life such as gardening and cooking, old and new recipes, and the transforming experience of a great bath or shower. We feel honored to work with beautiful and sensual pure natural ingredients, exotic and local. Making things by hand, from scratch has always been important to us and making the very best soap possible has become a passion. We adore nature’s richness and variety and are consistently amazed by it. Soapmaking is our way of adding to this celebration of life and sharing it with our friends, family, and customers. The reward of creating art and practicality out of pure and natural materials is our esteemed pleasure. 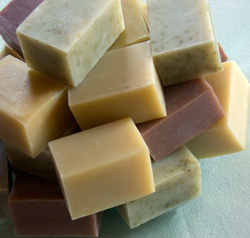 The business success we achieve as well, comes directly out of the quality of our soap. Introducing our soap to new people and having them return for more keeps us busy, happy and curious. We are fascinated by the development of new ideas and combinations that come to us through experiment, experience, and the ideas of customers. Our soap is at the center of this circle of creation. Knowing that the soap products we make are simple, subtle, fresh, and good for people, sustains our efforts. The importance of freshness in a truely natural handcrafted soap has been one of our most important discoveries as soapmakers. Because of this we have chosen to age-date each individual bar, an unusual and innovative practice. This important information assures our customers of consistent quality. The therapeutic qualities and aromatherapy benefits are most intense and valuable in a bar between four weeks and six months of age. This is particularly true for the volatile citrus and delicate floral essences, where aromas can fade and freshness really counts. Soap will continue to harden and cure for weeks and months and remain perfectly usable, but our goal is to bring you a vibrant natural soap product, young, and at the peak of its “bloom”. You will be amazed at the difference! Also notice the generous yet compact size of our soap bar. We do this on purpose to help the bar stay “new” longer, and to keep the fresh essential oil core of the soap better protected during curing and in use. The tall profile creates a low surface to volume ratio, making for a slow even cure, and a longer lasting bar. As people who appreciate the benefits of “The Bath” on many levels we invite you to share in the discovery of how rich and profound these simple pleasures can be. Be good to yourself, enjoy the unexpected happiness, stimulation, and comfort that a true fresh and natural soap experience can present, not only in bathing, but in your resulting thoughts and feelings as well.